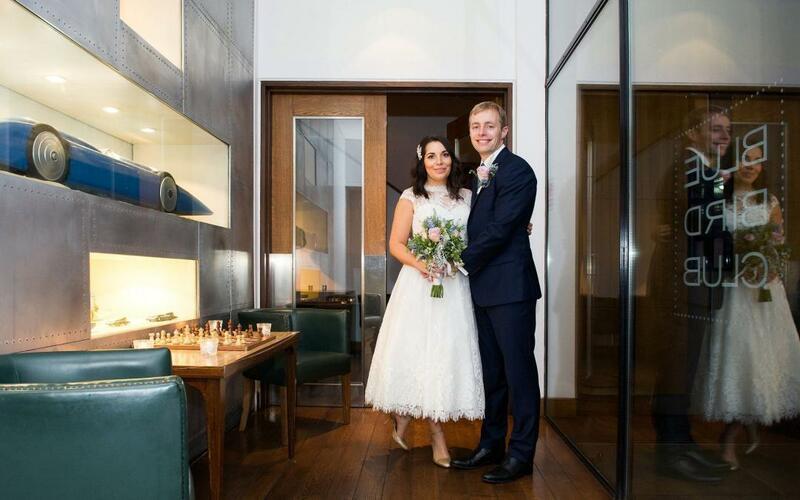 Marrying at Chelsea Old Town Hall or Kensington Town Hall? 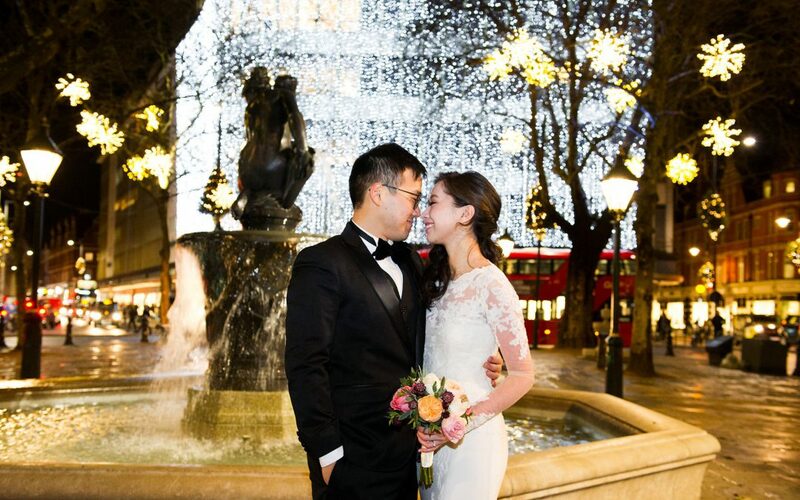 If you’re getting married at iconic Chelsea Old Town Hall or modern Kensington Town Hall, chances are that you’re bubbling with excitement and thinking about photos. 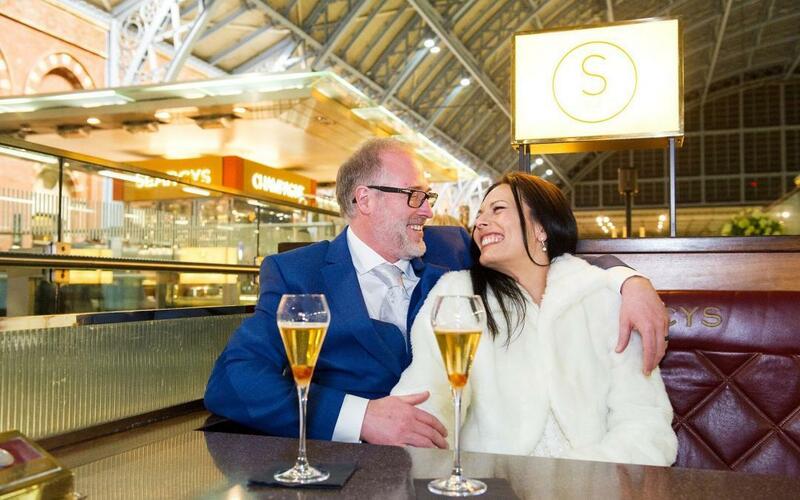 You may be planning an intimate ceremony with just two witnesses or a few dozen of your nearest and dearest, and on the day would like to spend as much time with them as possible. Which means that you just need an hour or two of photography. 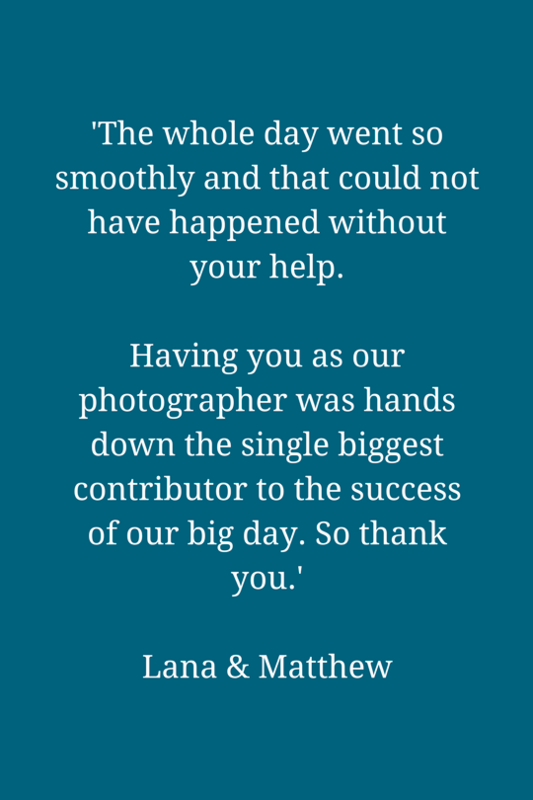 As a Chelsea Register Office wedding photographer, that’s what I do. You can book photography from one hour upwards. 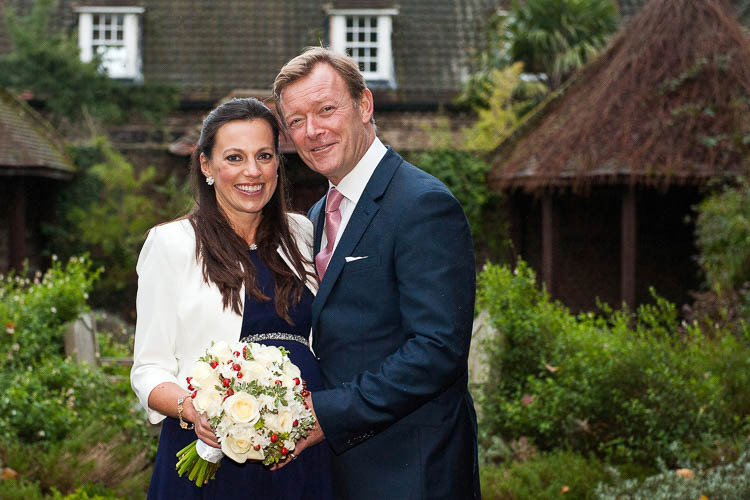 One hour covers your civil ceremony and photos on the steps of Chelsea Old Town Hall afterwards. Ideal for an elopement. 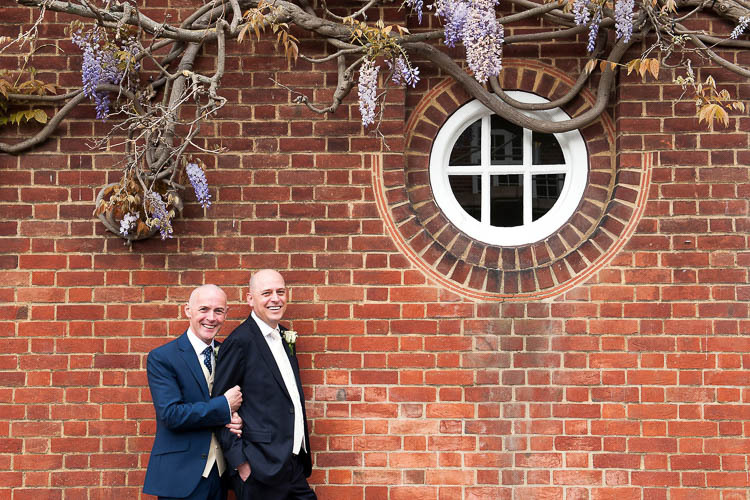 Your photography captures your arrival at Chelsea Old Town Hall, your ceremony and portraits of the two of you taken nearby. 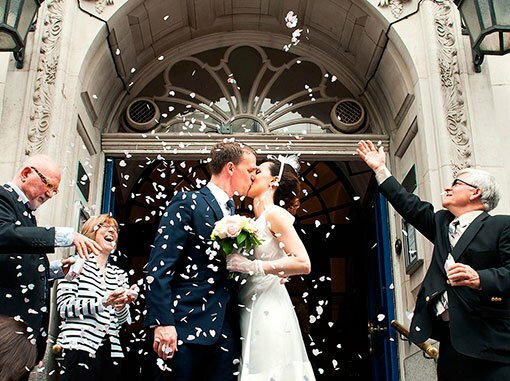 Your photography starts with your arrival at Chelsea Old Town Hall, the ceremony itself, confetti photos on the steps and continues through to either your drinks reception or portraits elsewhere in London, depending on distance. 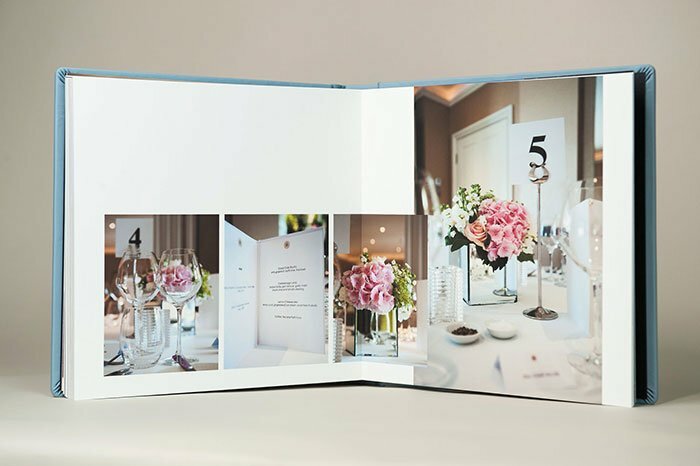 Have your favourite photos from your Chelsea Register Office civil ceremony designed and bound into a leather album that lives on your coffee table or book shelf. Standard sizes and copies for family are available. 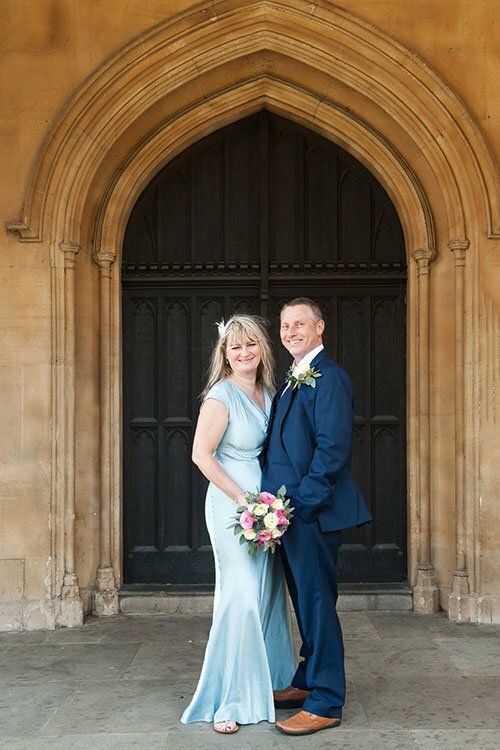 You and your guests should all be present at Chelsea Old Town Hall at least 15 minutes prior to your ceremony. There is a waiting area (with loo) just up the stairs from the Chelsea Manor Street entrance. 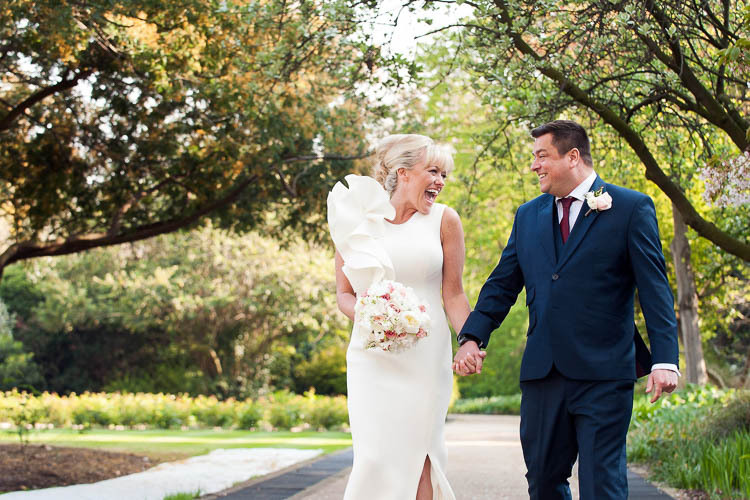 If you prefer not to see each other before the ceremony, the Registrar’s Office will advise you on timings and entrance plans. Your Registrar will conduct a legal interview with both of you, either together or separately, in private. 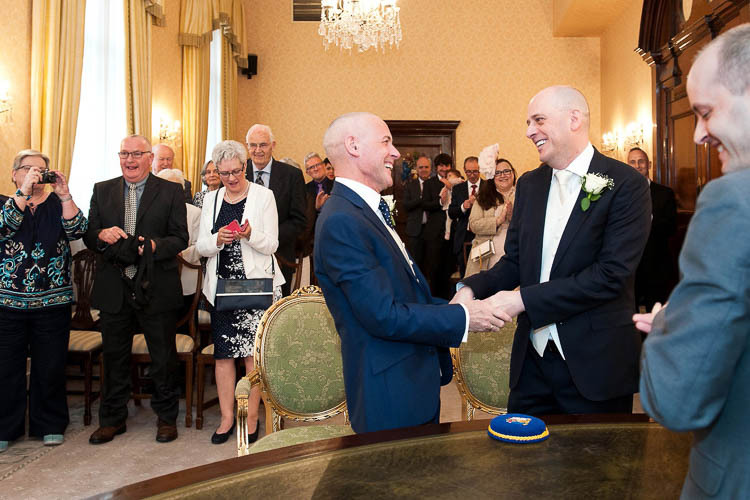 There are two meeting rooms used for this interview which are next door to the ceremony rooms, so you don’t have far to go. You will be asked to confirm all of the details that you gave in your Notice. 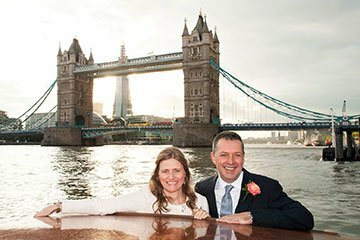 You need two witnesses for your Chelsea Register Office wedding. They must be over 16 and understand the language of the ceremony. Register Office staff are not allowed to act as witnesses. 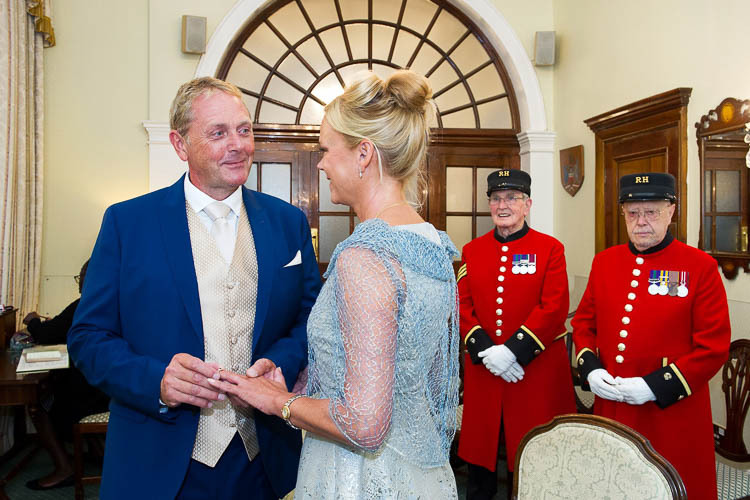 At Chelsea it is popular for couples who have chosen to marry in secret or without guests to ask Chelsea Pensioners to act as witnesses. 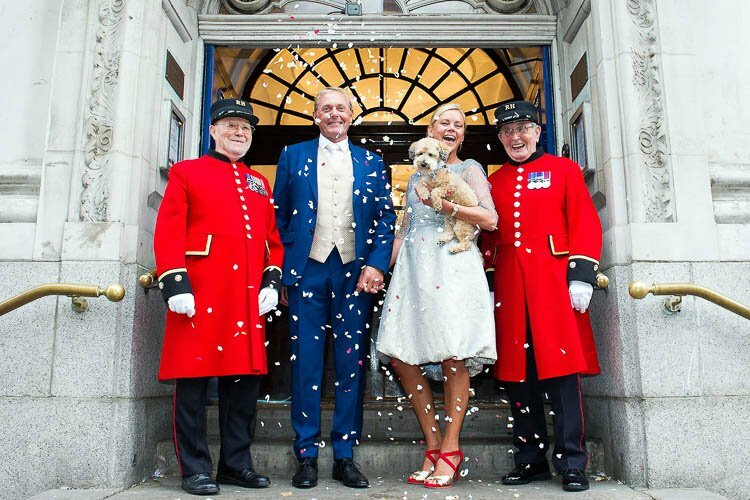 For more information please see the Chelsea Pensioners page. You do not need to know your witnesses. 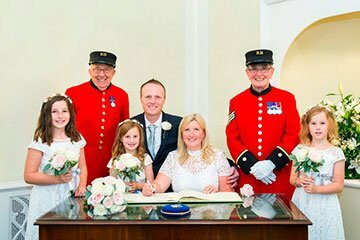 How do we book Chelsea Pensioners to act as witnesses? You can arrange this via the Kensington & Chelsea Register Office. For more information please see my Chelsea Pensioners page. What about confetti on the famous steps? 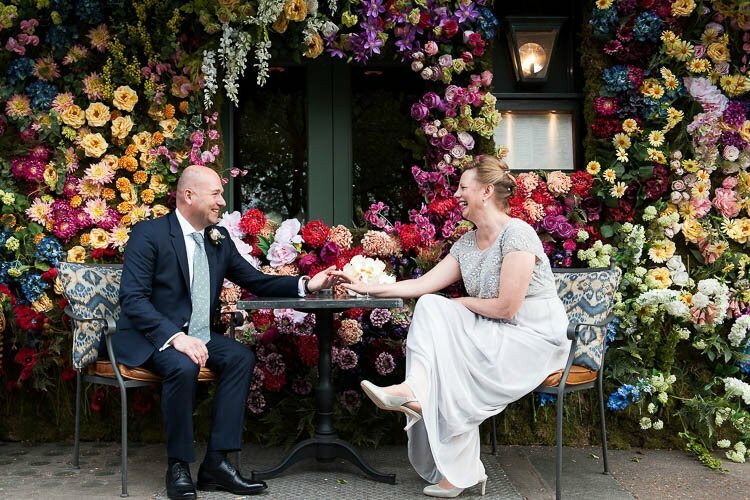 After your ceremony the Registrars will invite your guests to leave your ceremony room and take their position on the famous Kings Road steps. 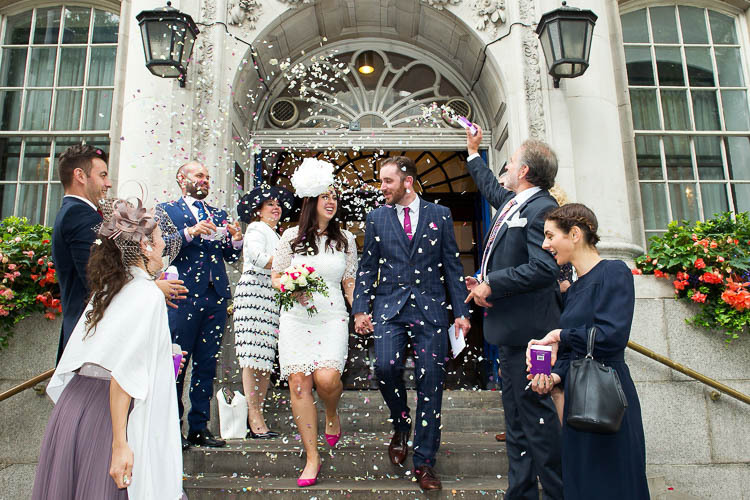 You can use any kind of confetti and confetti can also be bought from the Register Office reception desk downstairs from the Chelsea Manor Street entrance. 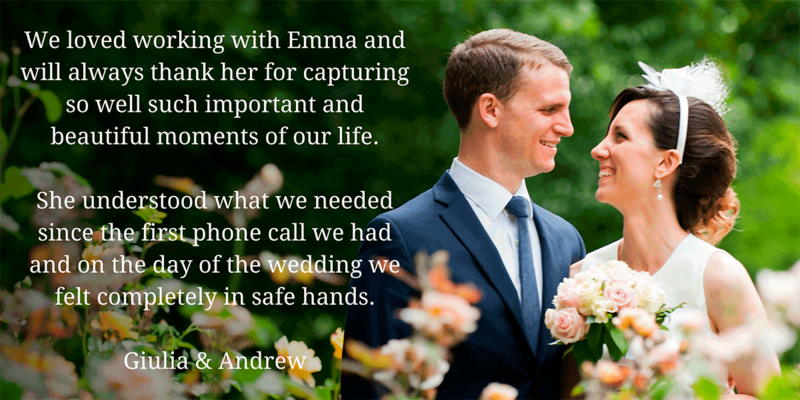 The Registrars will ask your photographer to give them the thumbs up for your exit. Umbrellas* work beautifully in light to medium rain. For heavy to torrential rain you can have your groups and couple portraits taken inside the Register Office. The waiting area with its red staircase and black and white floor tiles work well as backdrops. *Choose your umbrella with care. Whatever colour you choose will reflect that colour on your faces AND make your faces darker than the rest of you not shielded by the canopy. Black causes panda eyes and darkness. White casts a a mushy (unflattering) light. Clear works best and their designs have come a long way in the last few years (i.e. no longer fuddy-duddy) so don’t rule them out. If you don’t have clear be prepared to tip the canopy slightly back to allow light into your eyes. Check with your bride first. Her hair may not thank you if you tip it back too much! 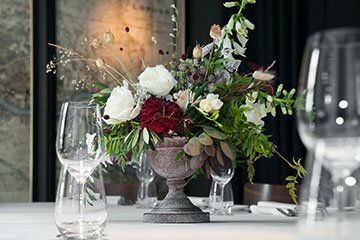 Chelsea Old Town Hall Autumn / Winter wedding? Download the Chelsea Register Office fact sheet below.